International DJ/producer Sebastien Drums from the french Cote D´Azur has successfully confirmed his position at the forefront of the new generation of international house music Djs and Producers. His mega hit ‘My Feelings For You’, was produced in cooperation with Avicii and sampled Cassius’ mighty original, quickly became a massive success after being released during Miami WMC and secured the Beatport No. 1 spot for a whole month and was playlisted by some of the worlds biggest DJs including; David Guetta, Bob Sinclar, Laidback Luke, Roger Sanchez, Robbie Riviera, whilst being repeatedly played by Pete Tong on BBC Radio 1 and licensed to many heavyweight labels like Superstar (Germany), Vicious (Austria), Work Machine (France) Vendetta (Spain). By the age of 11 Sebastien had fallen in love with electronic music and was heavily influenced by Daft Punk, Cassius, Bob Sinclar, Thomas Bangalter and Antoine Clamaran by the time he decided to start DJing. From 2006 to 2008, Sebastien became a resident at the Palas, a well known nightclub in the Cote D’Azur, where he played along side Axwell, Steve Angello, Benny Benassi, Little Louie Vega, and many more. Within that time Sebastien worked on many remixes for artists like Antoine Clamaran (Get Down), Alex Gaudino (Que Pasa Contigo), David Vendetta (Break For Love), Sandy Vee (Be Together), Celeda (The Underground) and even DJ Ralph (Keep On). 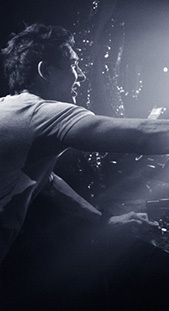 His remixes were played by the likes of Erick Morillo, Laidback Luke, Roger Sanchez („upfront track“ in his radio programme ‘Release Yourself’). 2009 was the year of success for Sebastien with notable releases such as ‘Funky Beep’ which had huge success during the 2009 Miami Winter Music Conference and received the support of nearly every top international DJ and became a huge Ibiza anthem during the summer months. Also, in March that year Sebastien met Avicii and the two artists decided to collaborate and worked together on many projects such as ‘Big Colossus’, ‘Wet Groove’, ‘Pastis’, ‘Even’ and of course their mega hit ‘My Feelings For You’, which was released in March 2010. In October 2010, Sebastien’s release, ’Tweet it’ with Tim Berg (aka AVICII) and Norman Doray was signed to Steve Angello’s legendary Size Records. This track received huge support from the likes of Swedish House Mafia in their live sets and was hugely popular among DJs around the world including Bob Sinclar, David Guetta, Laidback Luke, Dirty South and Roger Sanchez and gained a high position on the Beatport Top 100 chart. Since then Sebastien spent touring the world throughout France, Spain, Italy, UK, Sweden, Germany, Austria, Switzerland, Australia, Brazil, Azerbaijan etc… playing at some of the world’s most renowned clubs such as Cocoon (Frankfurt), Palais (Cannes), Ministry of Sound (London) to name a few. He also had the pleasure of playing huge festivals alongside his french DJ colleagues like David Guetta and Martin Solveig. More key tracks such as “Snus”, another collaboration with his friend Avicii, a remix of Albin Myers’ “Faking Love”, Sebastien’s superhot remix of David Guetta’s “Turn Me On” feat. Nicki Minaj, which were all very well received and garnered massive support from all the big hitters. Other tracks like „Here I Come“ and the massive Beatport No. 2 hit “French Rules“ (both released on Stealth Records), „Fly Again“ and „Resonorg“ (both on Spinnin) also gained massive support from all the usual suspects. After his first Ibiza residency at Space where Sebastien has played 10 times in 2012, he confirmed his Pacha Ibiza residency in 2013 with 9 dates split between the legendary Pure Pacha events and the new Epica nights. In that year Sebastien also played 2 outstanding gigs at the Blue Marlin Ibiza sundays. 2014 started off very strongly for Sebastien Drums. 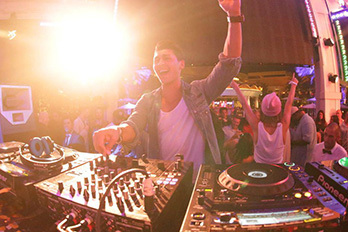 His 2012 track „Here I Come“ was again picked by the Swedish House Mafia to become a highlight track in each and every DJ Set they played over the last year. This support was crowned with a Bootleg of „Here I Come“ and the Acapella of „Leave The World Behind“ produced by Axwell himself. This new version even became one of the key tracks of the Swedish House Mafia – movie „Leave The World Behind and their live Soundtrack album „One Last Tour“. Sebastien also has just signed a deal with Ultra Records / Sony Music. His track „Wonka“ was released 18 July 2014. Besides that he has released the track „In The Stars“ (a collaboration with his friend Rib Adans) by giving it for free to his fans. His newest single is called „Brighter Than Gold“ and it will be released soon. In the summer of 2014 Sebastien Drums has been a resident DJ for the massive Neon Splash events at Privilege / Ibiza. He also played the first ever Neon Splash event in France. With forthcoming tours in the USA, Russia, Brazil, Asia, Europe and Australia the near future is already shaping up nicely for House music’s next superstar!